It's hard to believe that 15 years ago, there was precious little in Harbor East besides a few restaurants and the Marriott Hotel. The Minx and I would venture down there occasionally for dinner at Roy's Hawaiian Fusion or Charleston, but most of the area was parking lots and office buildings. It wasn't long, however, before the area was transformed into a destination spot for shopping and dining. And now with the towering edifices of the Legg Mason building and the Four Seasons Hotel. the Marriott seems tucked away like a cozy corner table in a large restaurant. One might forget that the hotel has an expansive, modern restaurant with an impressive view of the Harbor. 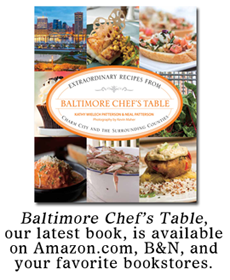 During Light City Baltimore, we were invited to the Marriott's restaurant, Appropoe's, to sample some of their cuisine and take in some of the flashy sights going on in the Harbor. We were more than happy to accept. We decided to order four items that might represent a cross-section of the menu. 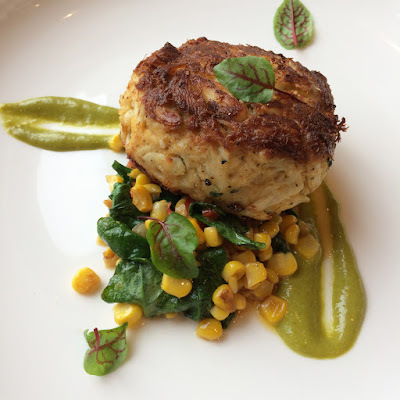 From the appetizers section, we ordered the jumbo lump crab cake with corn relish, wilted spinach, micro sorrel greens, and tarragon aioli. You can also order two crab cakes as an entree, but this cake is quite large and filling unto itself. The cake is mildly seasoned, allowing the natural crab flavor to come through, while the tarragon aioli is a nice touch for the relish. 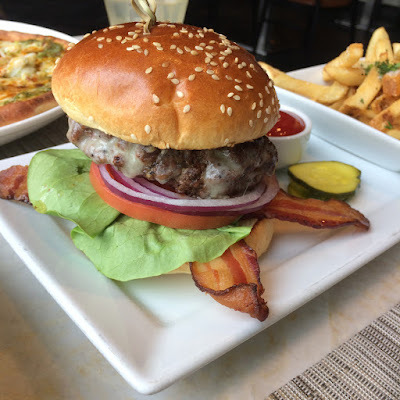 Burgers are always a go-to meal for people who might be dropping in after work for a cocktail and the Marriott burger is a solid choice. The patty is thick and luscious with crisp strips of smoked bacon, melted cheddar, lettuce, tomato, and red onion to round out the flavor and texture profile. Also, it's served on a proper hamburger bun rather than a brioche bun that usually dissolves in your hands, leaving you holding a pile of meat and condiments. Herb fries are a great side as well. From the pizza options we chose the white crab pizza because...Baltimore. 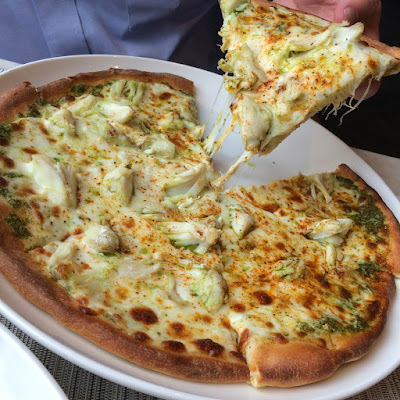 The crust is coated with a tasty pesto and topped with gooey fontina cheese, Old Bay seasoning, and giant chunks of crab. The crust is crispy around the edge and has a nice chew in the middle. The Minx and I are quite fond of wedge salads and Apropoe's has one of the prettiest we've ever seen. A small head of baby iceberg lettuce is sliced in half and set side by side. 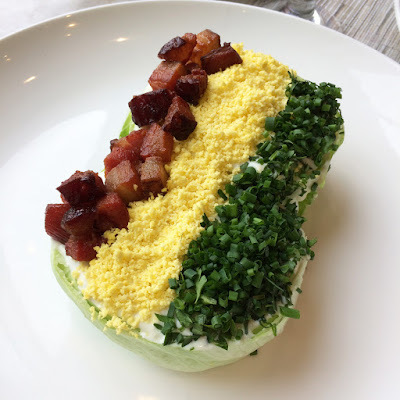 Then blue cheese dressing is applied and equal stripes of Nueske's applewood smoked bacon, finely chopped egg, and chopped parsley are layered on top. 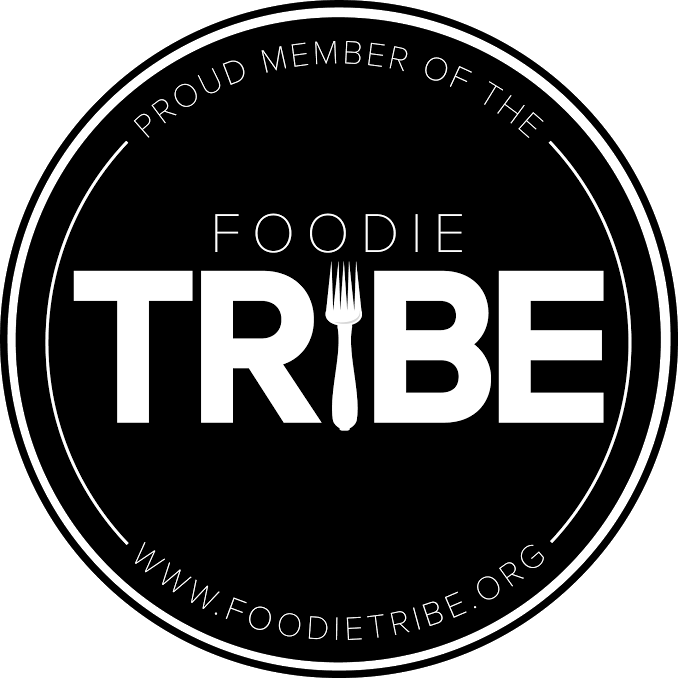 We each devoured an entire half, savoring the perfectly caramelized, thick cut bacon. I could see myself ordering this salad every time I go to Apropoe's. The day we went to Apropoe's had been rainy and cold. We had dragged ourselves into the restaurant, weighed down by the dreariness of the day. But the meal warmed our spirits with its diversity and heartiness. Stepping out into the chilly air, the Minx and I felt renewed. As we walked the promenade toward the Inner Harbor festivities, the gray clouds cleared away and we were greeted by a spectacular sunset. Funny how a good meal can turn your day around.